In the summer of 2003 hundreds of us occupied the Red Hill valley to stop the bulldozers. For decades the Red Hill expressway had been controversial and had left the community divided. We lost the struggle, however, and the expressway opened to traffic in 2007. Today I wonder, Who were the “we” that lost that struggle, and how did our taxpayers’ money get spent fighting against us? How does one end up on the wrong side of the law? Was it us? Or was it the law that was wrong? 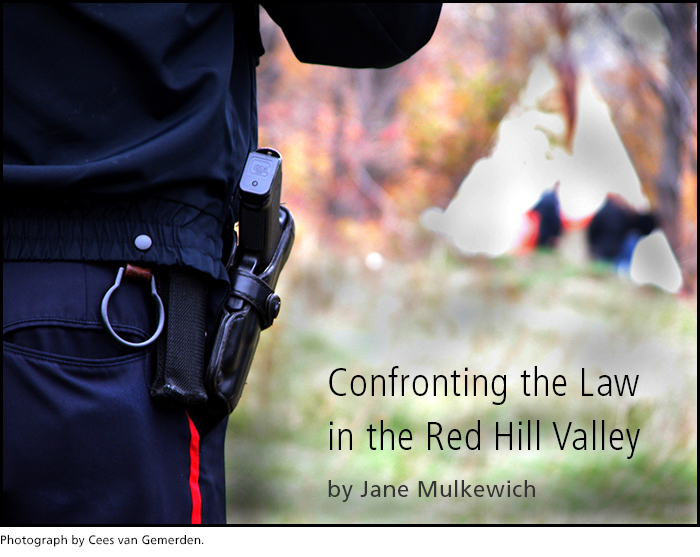 The Red Hill struggle in the summer of 2003 was a turning point for me and a crystallization of my understanding of the law. In 2005 I enrolled in law school and started studying law seriously. I wanted to understand how our laws could be used to justify the alienation of indigenous people from their land. I also wanted to know how we as white settlers could get the right to do whatever we wanted to the land without any regard for sustainability or ecology.